Manchu Mohan babu the name that doesnt need any introduction, the man who is famous as a film actor, social reformer and his educationa institution Sri Vidhyanikethan is purely well known more than these for his discipline, principles formulas and commitment for work and life. 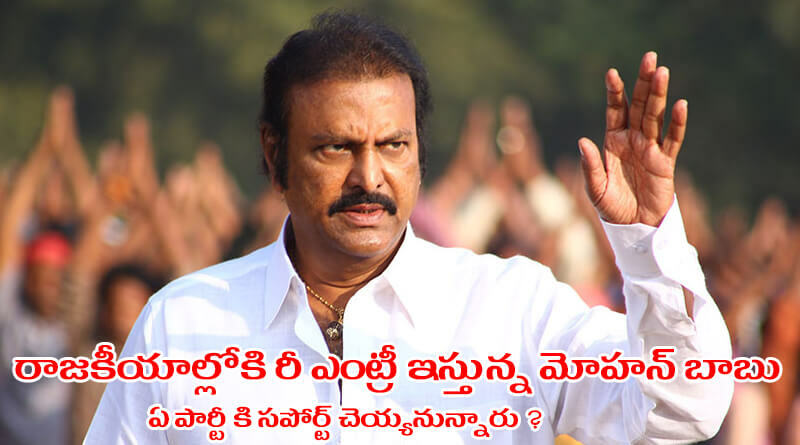 Collection king and former MP Manchu Mohan Babu has been now back into news with anouncement of his political re-entry. Today Mohan Babu during a press meet at Sri Vidyanikethen announced that he would enter politics once again to change the society. But to the surprise he didnt anounce the party he would join and said that he will soon announce which party will be in. It is known that Mohan babu is very close to Sr. Ntr family and with blessings of NTR Mohan Babu served as Rajya Sabha MP from the TDP during 1995-2001 and later left the active politics. It is well known to people of state that Mohan babu is a close relative of both Nara Chandrababu Naidu and the YSRCP president YS Jagan. As Manchu vishnu married cousin of YSRCP leader Jagan mohan babu may join YSRCP says few where as few says that Mohan babu is a even a relative of Chandr Babu Naidu and even a close associatre of Nandmuri Family and close to heart of Balkarishna so he would jpoin the party which gave him life as politician says others. So for a clear anouncement let's wait for a few time.